Krupnick Campbell partner Christopher Royer defends the State's findings that Marlins pitcher Jose Fernandez was operating the boat at the time he, Emelio Jesus Macias and Eduardo Rivero were killed when the vessel crashed on Sept. 25, 2016. Krupnick Campbell is defending the families of Macias and Rivero. 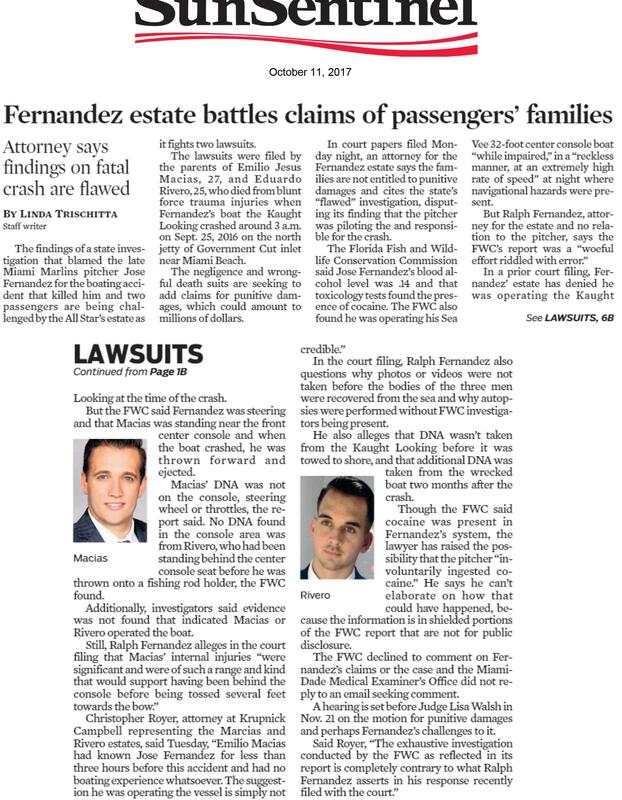 "Emilio Macias had known Jose Fernandez for less than three hours before this accident and had no boating experience whatsoever. The suggestion he was operating the vessel is simply not credible." Click here to read the online version of the Sun Sentinel story, or see the print version below.